Food deserts aren’t just a U.S. phenomenon. They’re found all around the world. This week as I explore social determinants of health and technology solutions in several parts of Europe, I’ve learned more about food access challenges in the UK. These are discussed in a report published this month by the Social Market Foundation asking, What are the barriers to eating healthily in the UK? The research was supported by Kellogg’s, the food manufacturer. The first table comes from the report, and the topline shows that about 4 in 10 Britons shopped at a cheaper food store in response to high food prices. One-third of people in the UK purchased cheaper and less healthy food instead of healthier, higher-priced items. I reviewed this report in the context of a conversation I had with one of my beloved and long-time colleagues, Ben Coleman. I worked with Ben over 20 years ago when we were very young collaborators on a program to educate U.S. businesses on the opportunities that the European Single Market represented for American businesses. This was in anticipation of “1992,” the launch of the European Economic Community. Ben was based in the UK, and I was in the U.S. where I was balancing my health advisory work with this transatlantic effort. Today, Ben Coleman is Cabinet Member for Health and Adult Social Care in the London Borough of Hammersmith & Fulham (LBHF). Little did I know, way back in the 1992 days of our collegial work relationship and budding friendship, that Ben would one day play with me in my sandbox of public health and social determinants. Today, Ben Coleman is Cabinet Member for Health and Adult Social Care, representing the London Borough of Hammersmith & Fulham (LBHF). Little did I know, way back in the 1992 days of our collegial work relationship and budding friendship, that Ben would one day play with me in my sandbox of public health and social determinants. When we met to catch up last week, our conversation turned to two of Ben’s objectives these days – loneliness (the topic of yesterday’s Health Populi blog) and food security. In my work with him over the years, I’ve known Ben to be all about inclusion and convening people who represent a broad range of interests and political bents in a getting-to-yes ethos. He has such a creative and positive mind, always crafting new ways to solve difficult challenges facing us humans. And so it is with the real human challenge of food security and nutrition access, which the Social Market Foundation recognizes throughout the UK — from northwest to southeast England and points in-between, in Scotland and in Wales. The map below illustrates the region’s food insecurity hot spots. Ben told me of a recent meet-up organized in his borough that took place in a local church. A nutritionist from the area led a session on healthy cooking and ingredients. “I’ve learned all about the value of turmeric,” Ben told me with a laugh. I called out the turmeric in this Health Populi post highlighting consumer food trends via Nielsen earlier this year. I was also glad to hear about this program taking place in a faith-based institution, which research in the U.S. has shown can help drive health in local communities where people live, work, play and pray. The Council is looking to develop a local approach to food strategy over the life course for citizens in the borough, from the youngest school-aged children to aging folks. Food, too, can address social isolation, we discussed, as part of the UK government’s macro loneliness strategy. 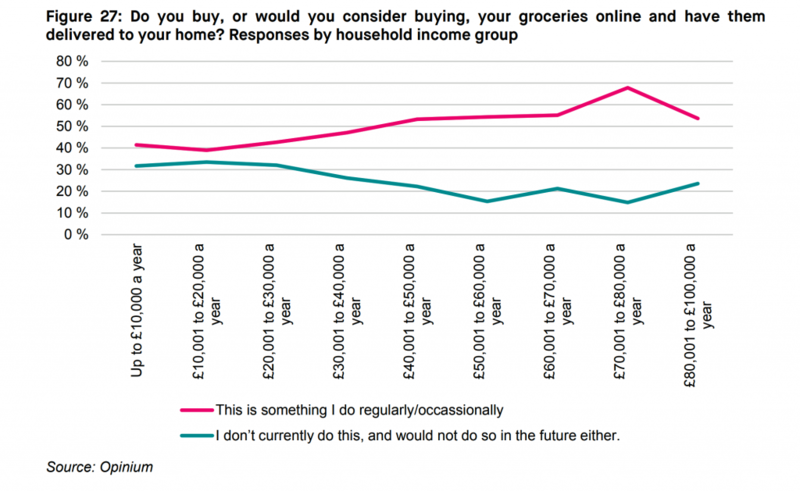 Food is a major component of household spending in the UK, accounting for one in every ten pounds spent by British homes. For people in the bottom 10% of incomes, food accounts for one-fifth of disposable household income. High and unaffordable food prices have resulted in people shopping in lower-priced grocery stores. One in four Britons have purchases cheaper and less healthy food as a result of too-high prices for healthier foodstuffs. One-fourth of people in the UK feel that healthy and nutritious food is unaffordable in the country — in particular, fresh products like meat and fish. 17% of UK consumers said fresh fruit was the most unaffordable item, and 11% said that would be fresh veg. 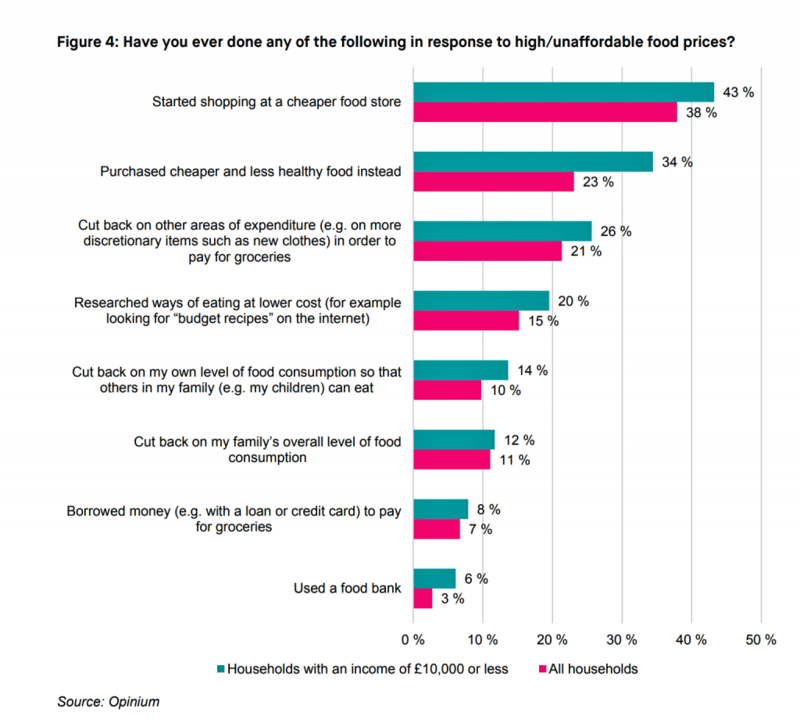 In contrast, only 5% of people said “crisps” (chips) and chocolate bars were the most unaffordable items in the grocery. 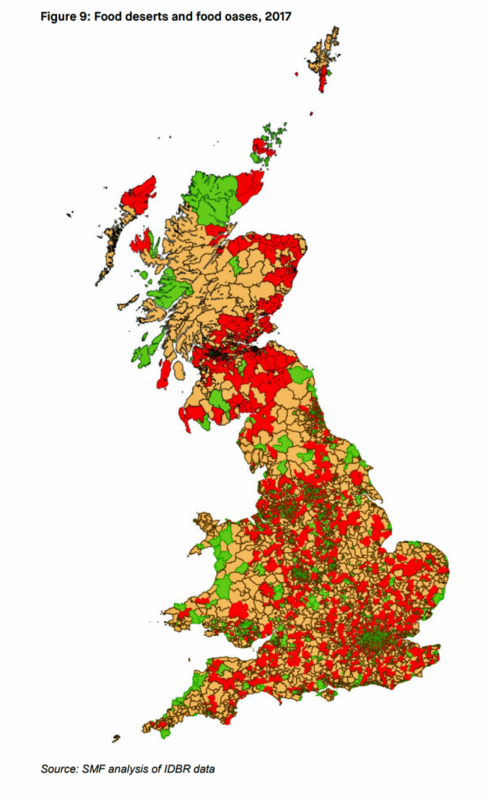 Some 10 million people in Great Britain live in food deserts, the report noted, illustrated in the map here. In a related public health story, the level of obesity among children in the UK is rising, based on this report from the National Child Measurement Programme which found an 8% increase in childhood obesity over the past ten years. Public Health England has met with organizations on the retail side of food, such as Domino’s Pizza, KFC, and McDonalds to discuss the merits of introducing “calorie caps” to their menu items. “Consumers [in the UK] are saying they want smaller portions and healthier options,” Dr. Alison Tedstone, who is the chief nutritionist of Public Health England, told The Telegraph newspaper as she discussed the implications of the measurement report. Health Populi’s Hot Points: As Dr. Tedstone has observed about her fellow UK health citizens, consumers are demanding healthier options. This is also true in the U.S., as I’ve noted over the past decade in my growing work on food-as-medicine and retail health. Here’s a recent Health Populi post on peoples’ growing call for food as their personal social determinant of health. As in the U.S., British grocers have been morphing into health destinations shoppers looking for well-being at retail. 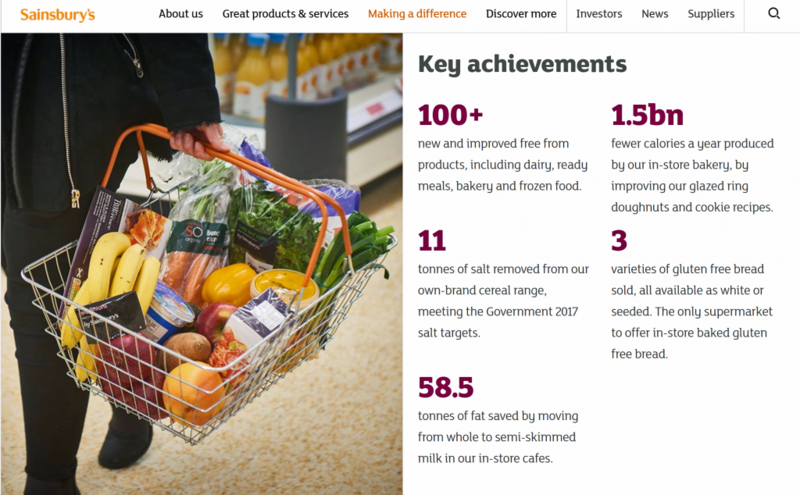 In this webpage from Sainsbury’s, the food retailer quantifies their commitment to health-through-food. This provides both data and knowledge along with a dose of good PR to health consumers seeking health, and a place to trust to share in good decision making. 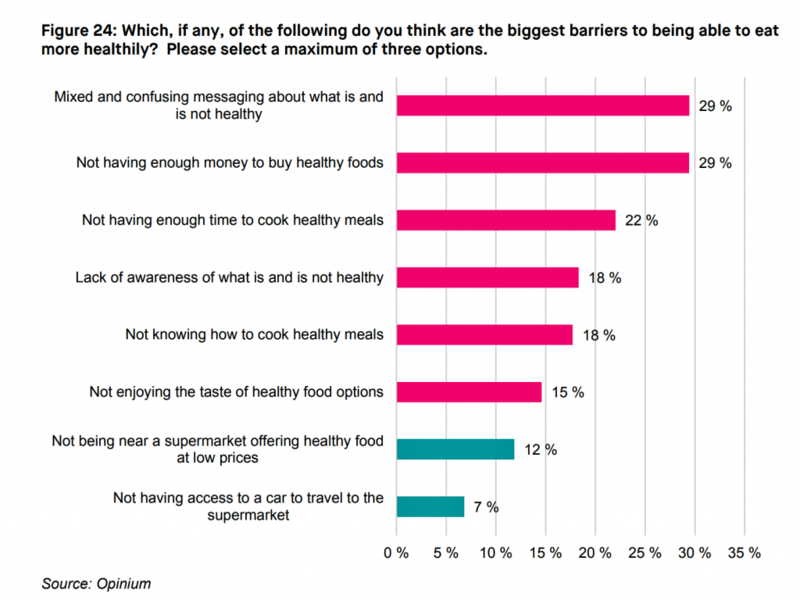 Please take another look at the second chart above from the Social Market eating healthily report; it tells us that consumers are seeking both knowledge-empowerment and food-health literacy along with financial wellness — traits Americans share with their British peers. There’s one final observation (among others I could name) to leave you to consider. That’s the role of ecommerce, like Amazon, Instacart and Ocado, among them, to deliver food to peoples’ homes that may be located in healthy food challenged geographies. Earlier this year in the U.S., Amazon began to offer discounted Prime membership to people enrolled SNAP benefits. The Social Market Foundation report found that a good proportion of folks in the UK might be interested in ordering fresh food via ecommerce. This could be one, among many, channeling/distribution strategies to help get nutritious food to those who need it most, and can little afford it. If an Amazon Prime membership [for example] could be socially prescribed and subsidized, whether by the NHS or Amazon or both in a new partnership, that could ease an additional financial burden in the short run prevention model that could save bigger healthcare costs downstream.